Not much going on at the Visitor Center this afternoon, so I ventured out into the drizzle to go for a hike on the Pacific Crest Trail south of Snoqualmie Pass. Summer means sun and warmth in some parts of the Northern Hemisphere, but it means marine air over the Cascade Crest. It’s like being enveloped in soggy gray flannel. Many visitors come to the Forest Service seeking advice on where to escape the damp, but the most intrepid of them go on up to the crest anyway. It was warm hiking in my raincoat. I indulged in some boot drainage as I climbed, kicking ditches along the outside of the trail so water could drain. Eventually the muck will dry out. It was grand to see all the flowers blooming in spite of the clouds–red heather, yellow arnica, orange paintbrush, and lots of white bunchberry. White-crowned sparrows sang, and fledgling robins hopped in front of me. The climb topped out at Beaver Lake, a shallow pond in a depression. More of a swamp. I looked for, and found, boomer holes. Beaver Lake is named for Aplodontia rufa or Mountain beaver, one of the Northwest’s most unique mammals. They are not really beavers, and not always montane. Another name is “boomer”, supposedly after a sound they are reputed to make. They are maligned as one of the most primitive rodents, and are notorious for hosting the biggest flea in the world. They are thought to be quite cranky, and if you called me primitive I’d be cranky too. Poor Boomer, just trying to make a living in a harsh world! They are enthusiastic burrowers in damp places, and spend much of their lives underground. They have tiny eyes and are active at night. Like pikas, they cut and gather vegetation which they pile to dry like little haystacks. These piles are later transferred to burrows. The trail crew is particularly interested in these animals because of their propensity for making holes in trails, which they have persistently done around Beaver Lake. 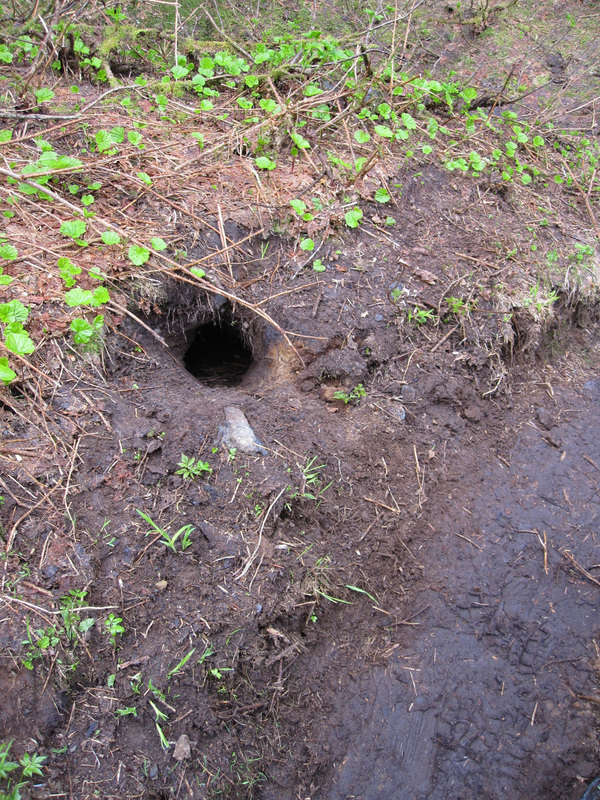 Boomer holes are big enough to catch a horse’s hoof or a human foot. Not safe! We stuff rocks into them, and of course Boomer chucks them out. It’s a never-ending dance. Actually not much is known about mountain beavers in the Cascades, especially east of the crest. No one has studied their range, as far as I know. The trail crew has found holes along Standup Creek in the Teanaway, which is further east than our district wildlife biologist had known about. Boomer has been behaving himself on this part of the PCT. No holes to fill in, so I turned around and hiked back.